One theme about art which I’ve heard all my life is that what’s left out is as important as what’s put in. 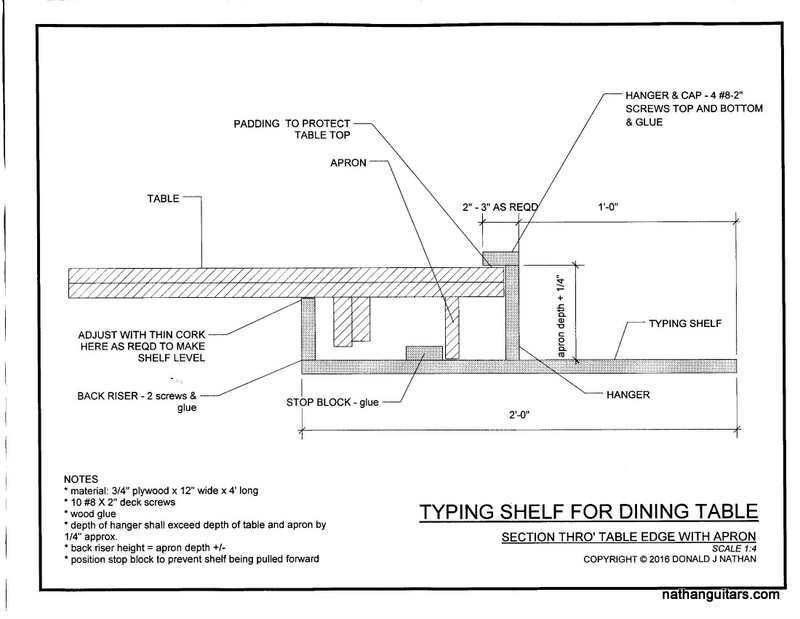 In architecture school, my most influential teacher said the best buildings looked simple, a sign of great skill in their design. Many great photographs were cropped from the original shots to achieve their best impact. I was looking at a picture I shot on the street recently, of a girl dressed up in various shades of pink. She had obviously gone to great lengths to achieve her look and it certainly drew my attention. But looking at the picture I began to notice things I hadn’t seen when I took it. Two men were coming, both dressed in black, with not the slightest nod to fashion. I couldn’t figure out if the picture worked this way or that, however, despite trying various crops – until I tried a function called ‘Cinemascope’. This removed even more than I had done in all my experiments, but I found it nevertheless had more impact. I give you both shots here, the original and the ‘Cinemascope’ version, for you to judge what works best. 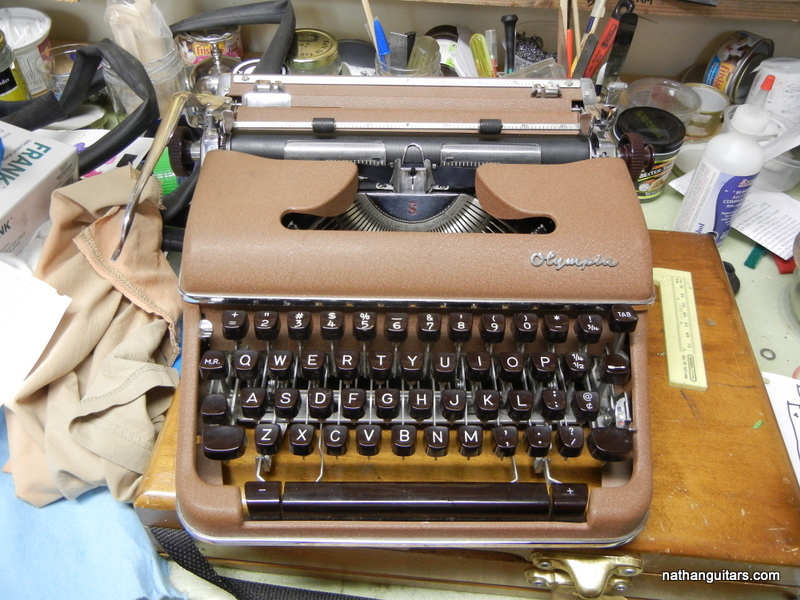 Last weekend I happened upon an interesting looking typewriter case in a local “curiosity shop”. I didn’t recognize the case nor the machine when I opened it up, and the badge was missing. I found the nameplate on the back however, which said it was an Oliver, made in England. Now I know what it is. 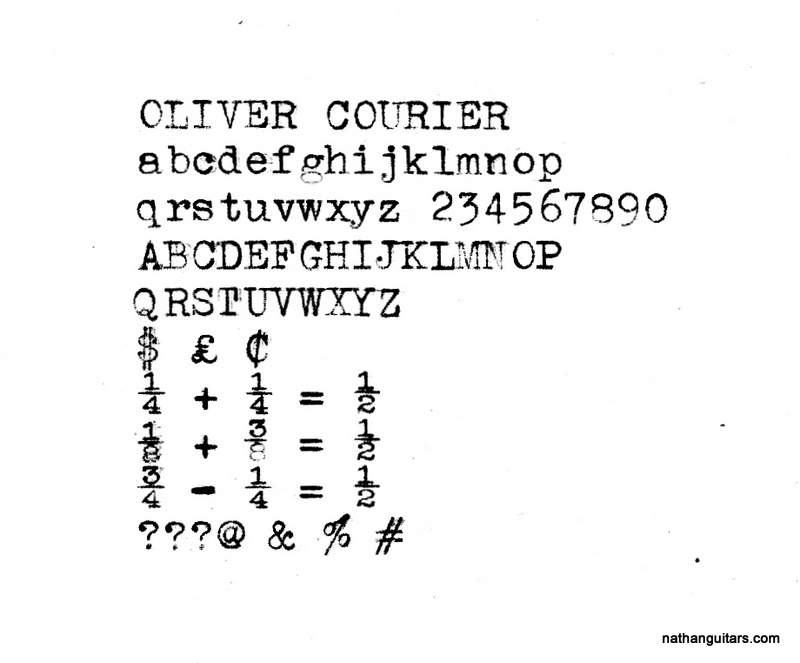 The Oliver Courier, aka Patria, and a number of other names. I returned with a box full of old cameras and we made a straight trade. It dates from 1956, and works very well still. I particularly like the typeface, which is pica of a most beautiful style. 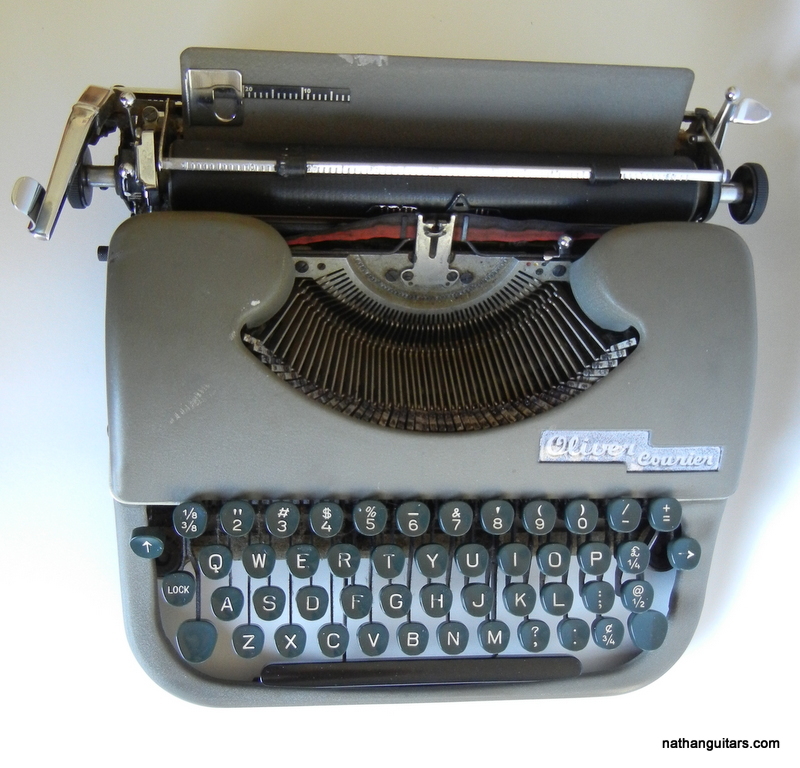 It is rather loud, and heavy of touch – it’s a man’s typewriter! Built to last. Heavy duty. The missing badge bothered me, so I found a photograph of it on line and made a quick imitation badge which slipped neatly into place through slots in the depression for it. Close enough, we’re not going for heritage status here. Wait – there’s more! 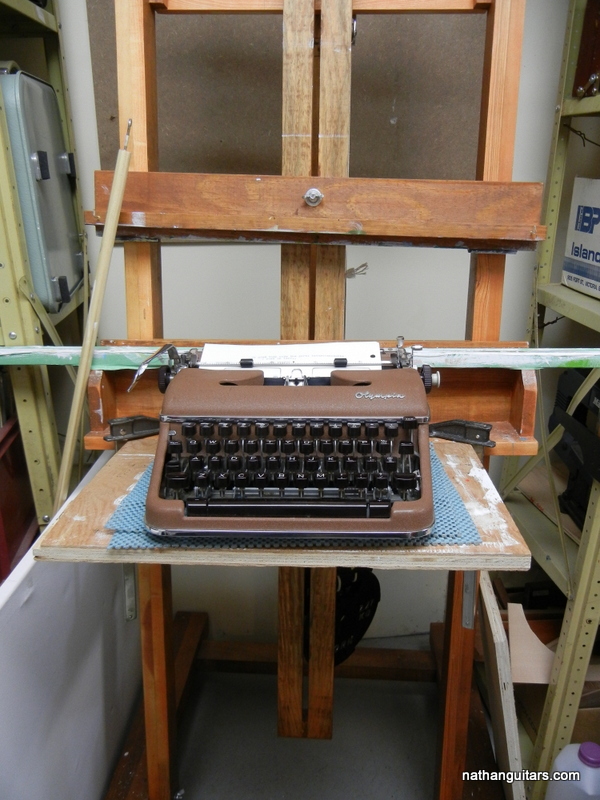 Inspired by my serendipitous discovery of the art easel as typing desk I decided to make a portable shelf to use at the dining table, rather than be stuck in the basement where there are no windows. So I came up with this idea, and built it in a day from a 12″ x 48″ piece of 3/4 birch veneer plywood. 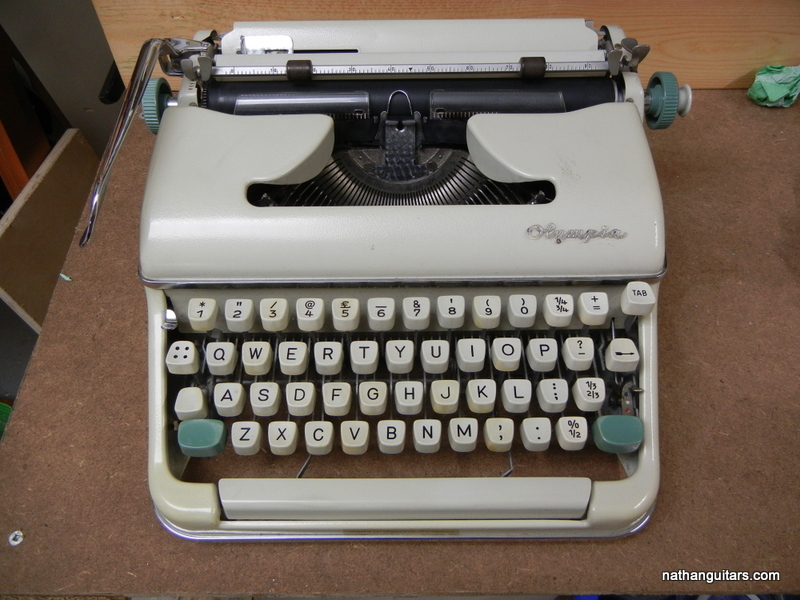 It works very well, and I’ve tested it with heavy typewriters – it’s solid. By lowering the machine I find it much easier to type, and of course it’s a lot more pleasant to sit in the dining room where I have a huge window beside me, and where I can also look right down the hall to the backyard, where a pair of House Sparrows have taken up residence in one of the birdhouses I installed in the trees one year ago. Tenants at last! If anyone’s interested, here is a drawing and a downloadable pdf file of it. The other day I picked up a cheap old tele-converter for Pentax, for five dollars. I thought I’d test it out with my 500mm Tamron mirror lens, just for fun, expecting nothing. This is close to a 28x power telescope on the APS-C size sensor of my K100 DSLR. There are two problems with doing this; first thing is it reduces the aperture another f stop from f8 to f11, thereby slowing down the shutter and forcing the ISO higher. Both those factors effect image quality negatively. But second; the thing is really hard to hold steady! However, in the sunshine today I was able to get a few shots, which proved not bad. Remarkable in a way, when you consider these were hand held. The hawk probably would have been acceptable if I’d used a tripod, as the shutter speed was 1/45th of a second. That’s absurdly slow for a 1000mm lens. I applied some post processing to that image to try to make it look more artsy, since it was rather fuzzy to begin with. The heron was about 200 feet away however, and it turned out not too badly. If I wanted to get better results than this I’d have to buy a lens that costs over a thousand bucks, which isn’t going to happen soon. Found at a thrift store for $40, with bridge almost detached. 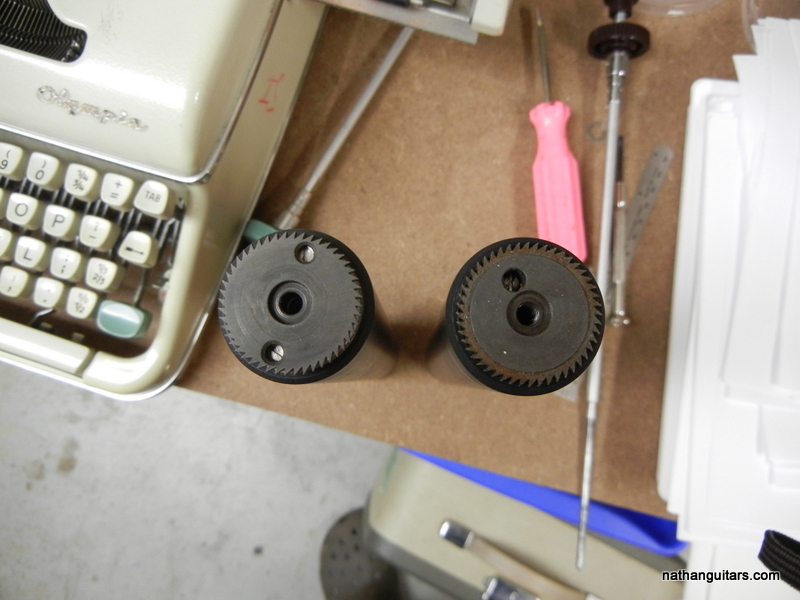 It also had cracks at the tailpiece, but nothing serious. Everything else about this guitar looked OK, so I brought it home to repair and maybe sell. Little did I know how great it would sound and play. First I patched up the cracks at the tail end. I didn’t bother to worry about how it looked, as I consider wear and tear on an old guitar part of its charm. I then pried off the bridge with a hot knife. It was obviously way too thin, for reasons that escape me, so I sanded it flat and glued on a 3mm thick scrap of walnut. The bridge is rosewood but I didn’t have any rosewood scraps about. I sanded the perimeter and stained the new wood black to match the stained rosewood. After prepping the top by a little sanding to smooth it out, I reattached the bridge with clamps and cauls. That brought the bone saddle a bit too high, so I had to bring it down a millimeter or so. Looking inside I found that the bridge plate was a piece of softwood, which was getting chewed up by the string nuts, so I glued in another small walnut plate to strengthen that. Some guitarists have removed heavy bridge plates, but what I added was not even an ounce of wood, so I had no qualms about potentially muffling the tone here. Six new 25c bridge pins and a set of extra light Gibson phosphor bronze strings completed the repairs. I prefer using light gauge strings, if only because I’m quite used to how they feel. This guitar most certainly didn’t need heavy strings for it to deliver the goods. I didn’t know anything about these guitars before but I’m wise now. This one is quite excellent. 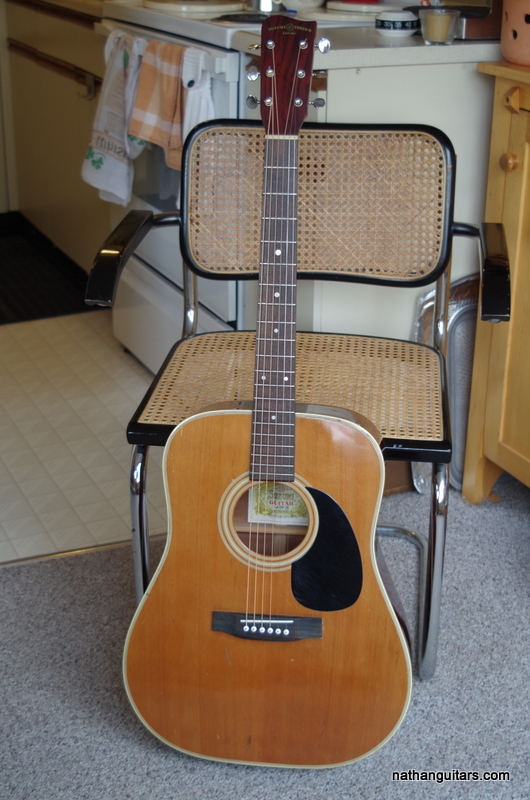 It has a fine top of solid spruce, and the bracing is pretty much standard post-war Martin Dreadnought. The body is all laminates but that is not a problem here – this thing has killer vibes! 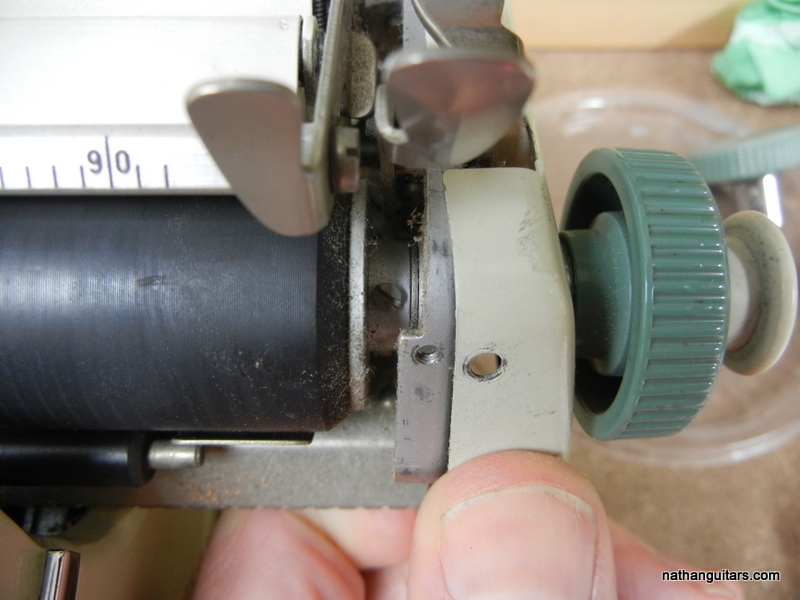 The post-war Martins had their braces moved back an inch to make the tops less prone to warping, as well as having straight braces, as opposed to the earlier scalloped design. There are heated arguments on both sides as to which design is best. Taking advantage of this, Martin now makes some models with “forward shifted scalloped bracing”. This is basically their old design made new again. But every design change to a musical instrument has consequences. The new old design being lighter braced, and forward-shifted means the sound is bigger and has even more overtones. Some players like this sound, and are convinced it’s better. Others say it tends to muddiness. All those overtones cannot be had without a concurrent change in the whole dynamic, which means you lose clarity of the fundamental note. I love the clarity of this guitar, which I would attribute somewhat to the “tighter” bracing of the old=new post-war backward-shifted non-scalloped design. Whew! One difference I observed in the bracing vis-a-vis the Martin standard, is that the main x-braces appear thicker but lower. So Suzuki copied Martin, but not quite exactly. I was contemplating selling this guitar at first, but after playing it I decided to keep it – it’s just too good an instrument to part with, and for what the market would value this at, not enough money to turn around and buy anything nearly as good. 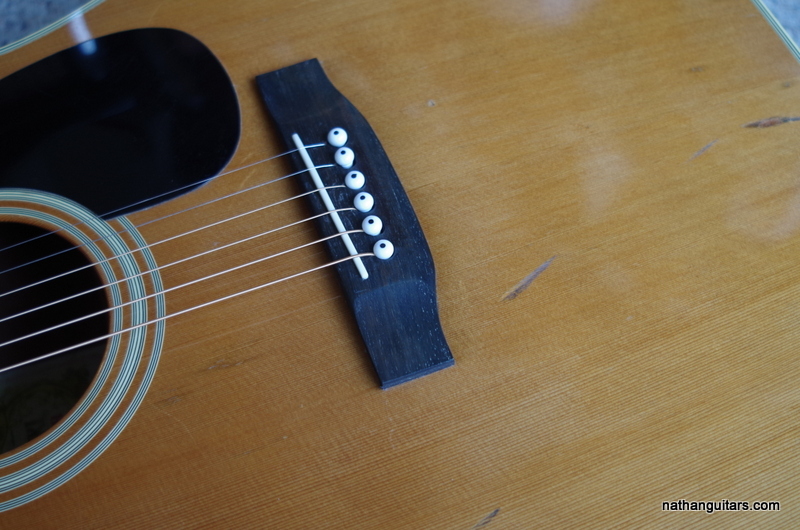 Considering it dates from 1977 as far as I can gather, it hasn’t much wear on the frets – they’re almost unworn. This guitar has the power and bass of a good dreadnought, but quite a distinct clarity when picked. 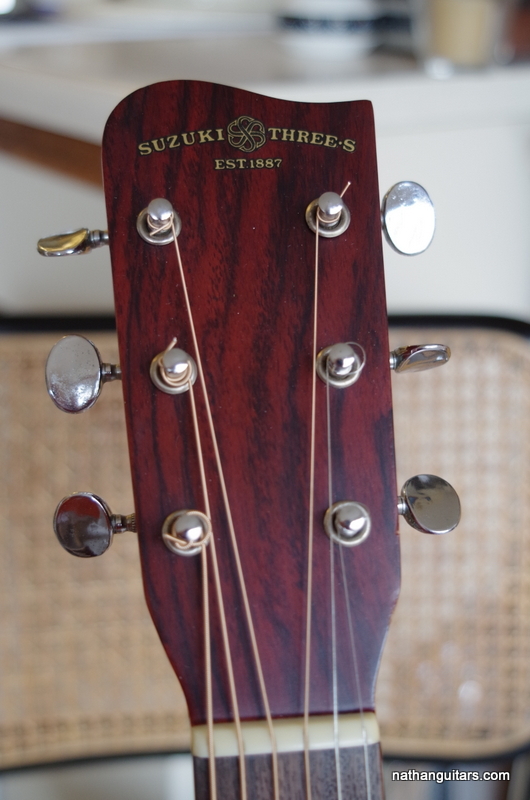 Now I will be on the lookout for more old Suzuki guitars. 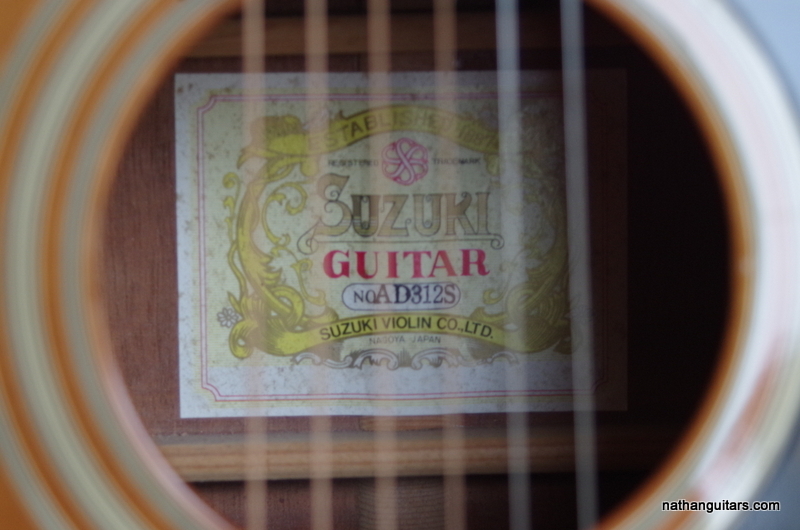 Suzuki Nagoya no longer make guitars but they still exist and make violins, as they have done since 1887 according to their label.